Click here to see more fabulous entries in the Week 12 Challenge. The actual challenge from "i heart faces" . . . Unusual angles are fun and cool...and they make your photo stand out from the rest of the pack. For this week's photo challenge, we are focusing on unusual angles. Stand higher than your subject, lay on the ground, move to the side, tilt your camera while you are shooting...do what you need to do to give your photo a uniqueness of it's own. A unique angle is what this week is all about. And (of course!) make sure at least one face is clearly showing in your photo entry as well. I love this picture of my grandson, taken February of this year. He was very interested in being photographed, so I took advantage of his extended attention span, a true rarity. Hope you like it too! Thank you so much for entering our photo challenge this week! I like how the tilt in your angle makes the depth of field in the fence really stand out. Awesome picture!! Love the chain link fence in the foreground and his great smile! Thanks for your nice comment on my picture! That is a fabulous shot!! Great job!! I LOVE this angle! Thanks for stopping by my blog! I love your composition. Had to do a double take - love it! I really love this shot!!!! I love the way the fence pops at you! This is a fantastic shot. Thanks for the kind words about my tree shot. My daughter is a very cooperative subject! Super cool angle shot - love it! Neat and interesting shot of this little monkey. Thanks for stopping by the blog. A picture of just the fence at that angle would be cool, but then you add in your grandson, and it's awesome! Oh wow, this is fabulous! I love that he was so agreeable. This is a GREAT photo! Everything is perfect for the theme this week, especially the fence he is climbing on...nice work! WOW!! I love, love, love your entry!!! The angle on the fence really makes the shot!! 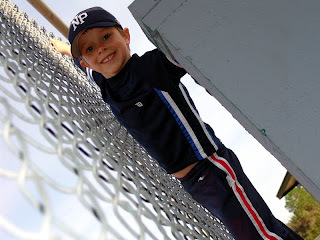 The line of the chain link fence in this picture is AMAZING- not to mention the cutie that your grandson is! Thanks so much for the comments over at my blog! love the textures and fun in this shot! This is a really interesting shot!